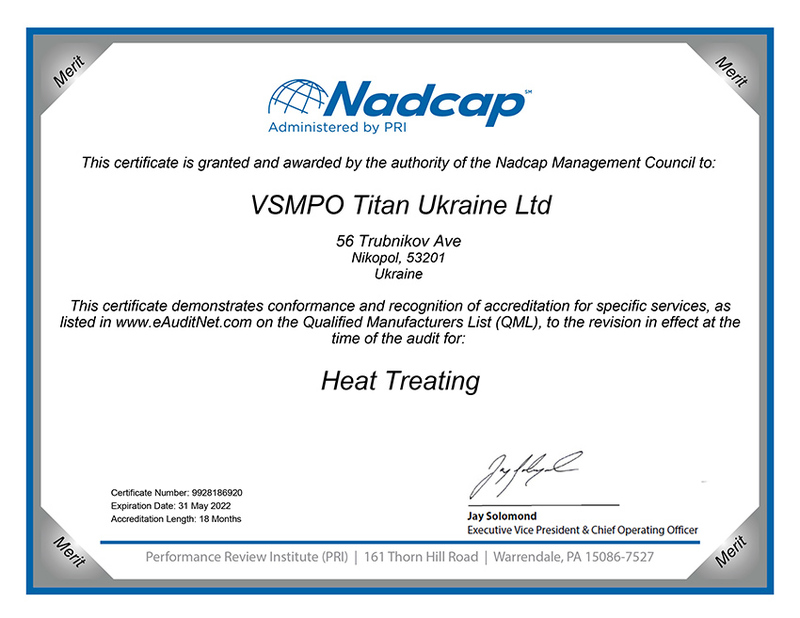 Certificates - VSMPO Titan Ukraine Ltd. Certificate № 44 100 15 32 0056 d/d 10.09.2015 issued by TÜV NORD for compliance of quality management system with requirements of international standard ISO 9001 in the field of design and production of seamless and welded tubes of titanium — base alloys. Certificate № UK952017-1 from 30.08.2017 Bureau Veritas Certification for compliance of quality management system with requirements according to 9001 EN 9100:2009 «Quality Management Systems — Requirements for Aviation, Space and Defense Organizations». 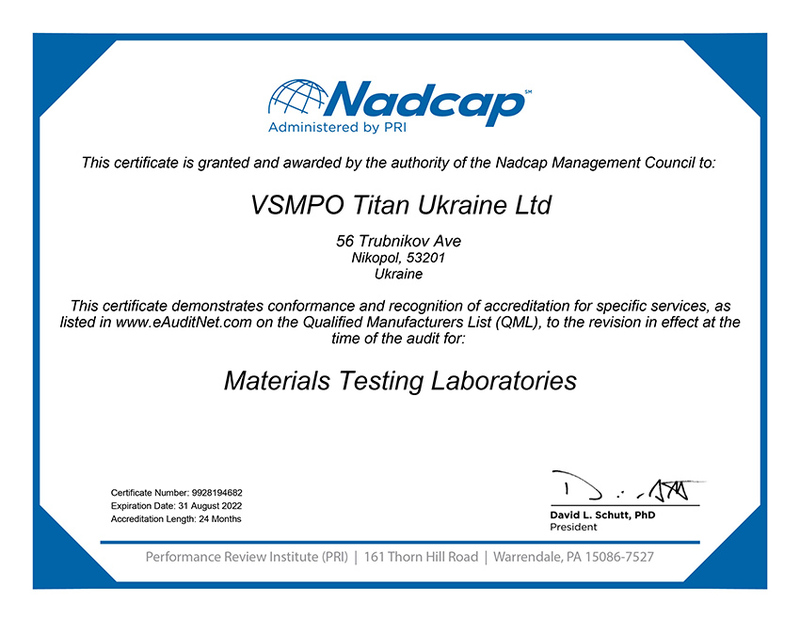 Scope of certification: production of seamless tubes from titanium alloys. Certificate No. 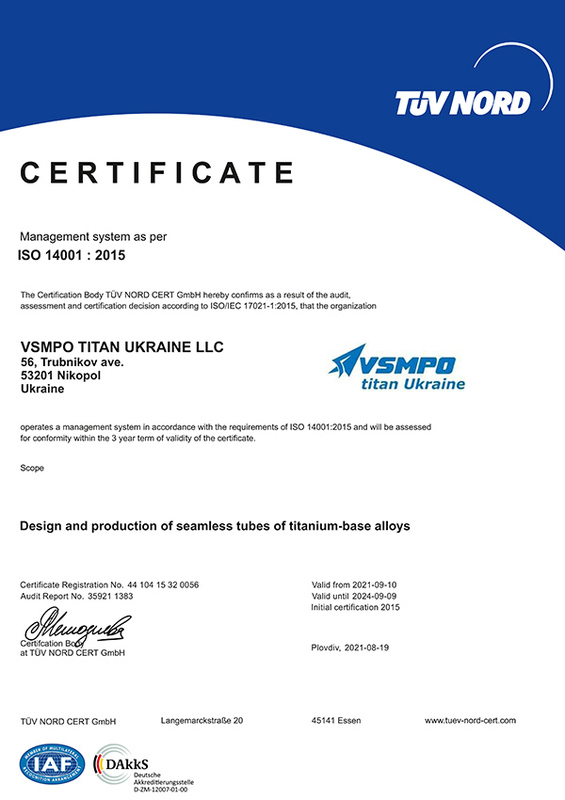 44 104 15320056 d/d 10.09.2015 issued by TÜV NORD about the correspondence of Environmental Management System to the requirements of ISO 14001 in the field of design and production of seamless and welded tubes of titanium — base alloys. Certificate № 2595 202 CZ/Q-170145 d/d 18.07.2017 issued by TÜV Rheinland for the material production quality assurance system according to Directive 2014/68/EU according to the requirements of EN 764–5 and AD 2000 — Merkblatt WO giving the right to produce seamless and welded tubes from titanium alloys. Seamless tubes: Grade 1,2,3,7,9,12; Ti1,Ti2,Ti3,TiAl3V2,5 with diameter 2.0 to 133 mm, wall thickness from 0,25 to 7,5 mm according to ASTM B 338 / ASME SB 338, ASTM B 861 / ASME SB 861, Din 17861, VdTUV WB 230/2. Welded tubes: Grade 1,2 with diameter 12.0 to 60,3 mm, wall thickness from 0,4 to 0,7 mm according to ASTM B 338 / ASME SB 338. 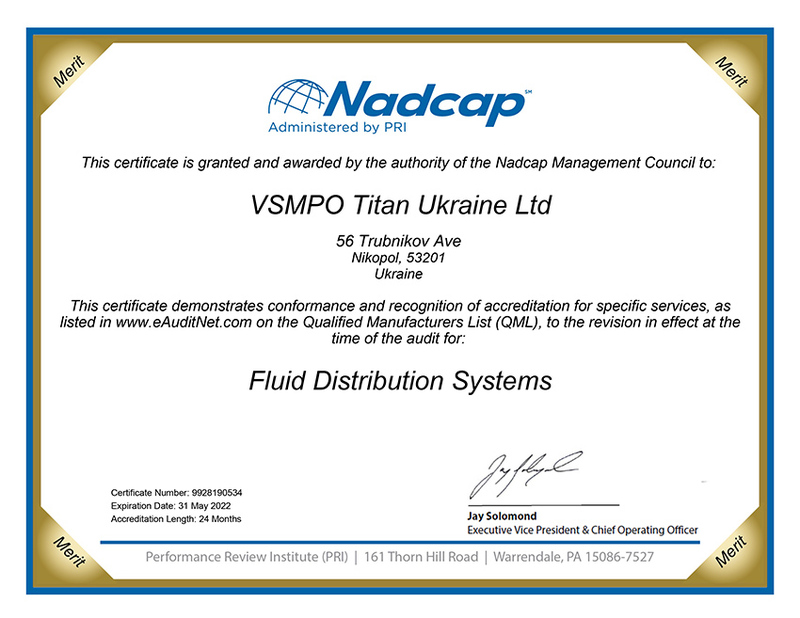 Issued by PRI institute on qualification of Hydraulic Tubes Manufacturer (Fluid Distribution Systems) according to Nadcap program with registering in the Qualified Manufacturers List. Certificate MD 00/3547/0004/4 d/d 06.12.2017 issued by Lloyds Register.